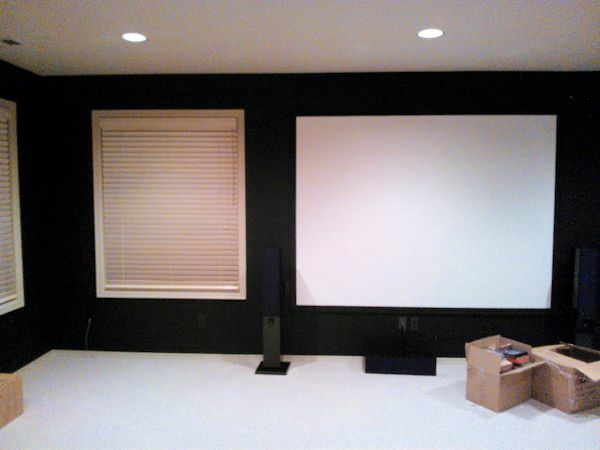 These Bellevue clients inherited an ancient home theater in a bonus room of their new home. In it’s day it was a high end system that still worked, after the clients had watched a couple movies up there, they thought it was fun and wanted to do a redesign of the space and upgrade to HD. The design goal was a clean contemporary look with everything built in and more seating space. The old theater was decidedly standard def with a smallish 84″ 4:3 aspect screen right alongside a window and a gigantic CRT projector dominating the ceiling in the center of the room. The source gear was simply stacked up on top of a corner cabinetry built in with exposed wires running everywhere. We upgraded to a 130″ diagonal Stewart Filmscreen microperf acoustically transparent screen to conceal the L/C/R channels behind with a slim profile custom frame fabricated by us. Screen orientation in the room was switched to open up the options for more seating space and a cleaner look. The closet was re-purposed to install source components with thermostatically controlled ventilation for cooling the gear. 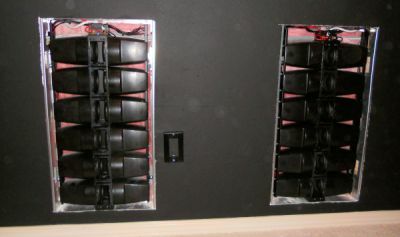 BG Radia was chosen for their highest quality built in speaker designs and this project used the BGX subs, the world’s first THX Ultra rated inwall subwoofer for even bass response down to 20 Hz in the room. BG Radia PD6-LCRi were chosen for five surround channels. The planar tweeter design in these models offers controlled directivity that reduces the need for acoustic treatment in a properly engineered design. 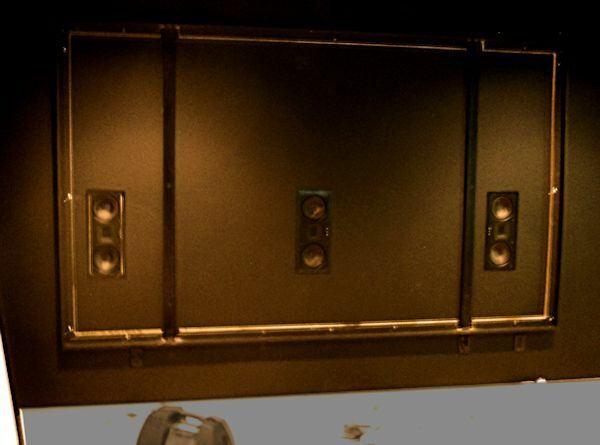 Audio calibration and screen EQ were done manually using our Acoustisoft R+D measurement suite. 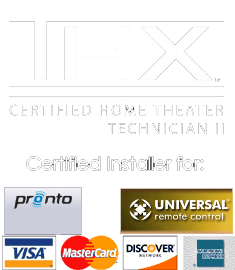 Source components included: Pioneer Elite THX Certified receiver, Elite BluRay, Apple TV, Mac Mini, OTA HDTV with attic antenna and Comcast. 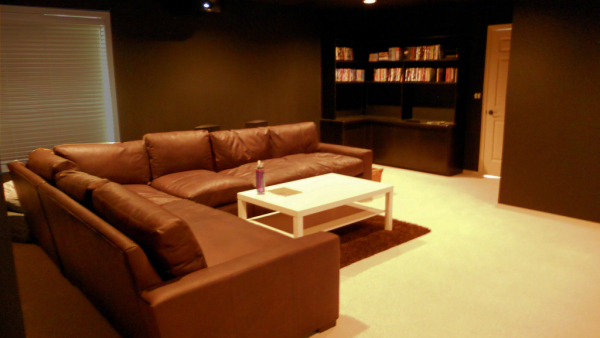 A URC MX-450 RF remote controls the AV system and the Lutron lighting as well. 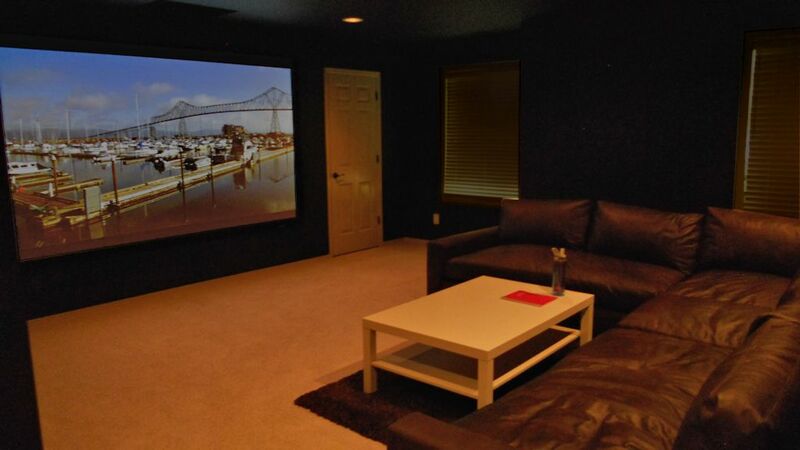 A JVC 4K eShift 3D projector shoots a nice accurate image to the 130″ Stewart Filmscreen with Studiotek fabric with the screen gain designed for the projector in this environment.